Oh how I love over ripe bananas. There are so many great things you can do with them. Freeze them for smoothies or banana ice cream, banana bread, banana muffins, banana cookies, the list goes on… The following is my latest and favorite recipe. The kids devoured these and asked for more! 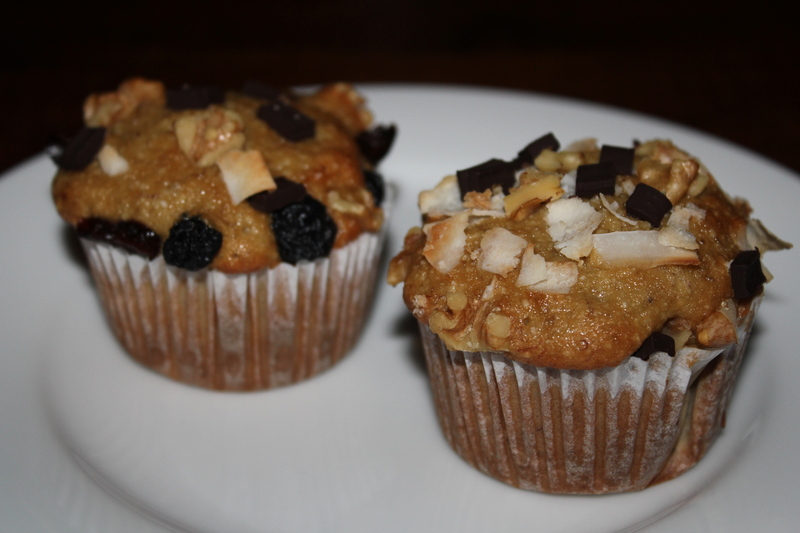 They are gluten free, dairy free, and nut free if you choose. Combine dry ingredients in a mixing bowl. Add remaining ingredients and mix on low speed of an electric mixer until blended. Mix on medium-high speed for 2 minutes. Fill cupcake pan with cupcake liners. Fill until 3/4 full. Sprinkle toppings over each. Bake in a 350 degree oven for 18 to 20 minutes. Baking is always fun with the kids (if old enough). Mine are 4 and 6 and love to help. I have them mash the bananas and help measure the ingredients. I think they enjoy and appreciate it more when they do it. Here were our toppings. Sprouting is the practice of soaking, draining and then rinsing seeds, beans or grains at regular intervals until they germinate, or sprout. So, what’s the big deal (as my kids would say)? Sprouting beans and grains actually changes the nutrient contents. The protein quality increases, fiber increases, essential fatty acid increases, vitamin content increases and minerals chelate that increase their function and sprouts are easily digested. Need I say more? Many raw foodists eat lots of sprouted beans and grains to get their protein and fiber. I tried doing about 70% raw a few years ago but lost too much weight but I wasn’t doing the sprouted foods. The only things I have sprouted myself is chickpeas and that was for a raw hummus recipe. Delicious but it takes a 8 hours of soaking and then 2 days of rinsing before they are sprouted and ready to use so not really something you can do on a whim. I have found two amazing products that I love right now. 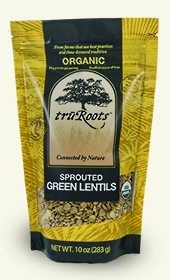 truRoots Organic Sprouted Green Lentils and thanks to my sister-in-law I have come to love the truRoots Organic Sprouted Mung Beans. I have only found these at Whole Foods. You could sprout your own lentils since they are pretty easy to find but I have not found mung beans but suppose you could find at an Indian or perhaps Asian market. I have two delicious recipes for these items below. 1. Cook lentils according to directions. 2. In a medium-sized pot, combine the tomatoes, a drizzle of olive oil and spices. Cook over medium-high heat until tomatoes start to soften, about 5 minutes or so. 3. 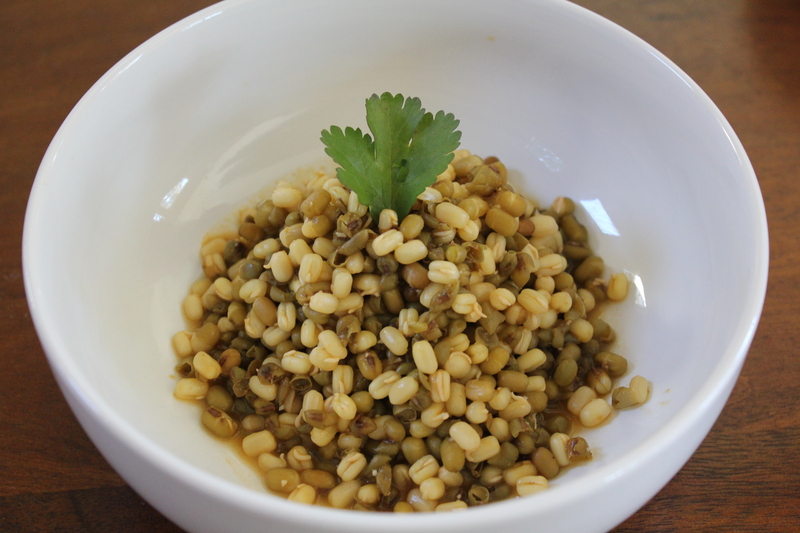 Add your drained lentils and cook for another 5 -10 minutes, until the lentils have really absorbed all the flavors. Add extra spices as necessary. 4. Assemble with whole grain tortillas, guacamole, salsa, etc. 1. Bring broth or water to boil in a pot and add mung beans. Cook 5-7 minutes. Turn off the heat, and cover with lid and let sit for 5 minutes. Drain excess liquid, if needed. 2. Add seasonings and lime juice to taste. If used water may want more seasonings. Enjoy! I haven’t tried with rice but I’m sure that would be delicious. By the way, I hope everyone is having a great and healthy new year! I have lots to come so stay tuned…. Farro (pronounced FAHR-oh) is one of the oldest grains originally found in the Middle East but not grown primarily in Italy. Farro is an ancient grain that is now being rediscovered by chefs throughout Europe and North America. It is not wheat, but a plant and grain all its own. 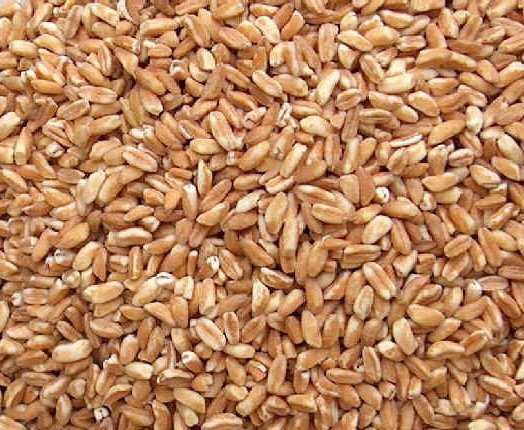 A farro grain looks like light brown rice and has a nutty taste that’s reminiscent of oats and barley. Lighter than other whole grains, farro, contains a starch similar to Arborio rice, which releases a creamy, binding liquid when cooked. It is rich in protein, fiber, magnesium and vitamins A, B, C and E, farro is easily digested and low in gluten, which makes it a good choice for those who are wheat-sensitive. It is grown in Italy. A few months ago I was in Costco and noticed a huge bag of Farro and not knowing what it was I passed it up and got some more Quinoa. Finally, I decided to try it after my sister-in-law said I should. I was really delighted because it is almost creamy like risotto. 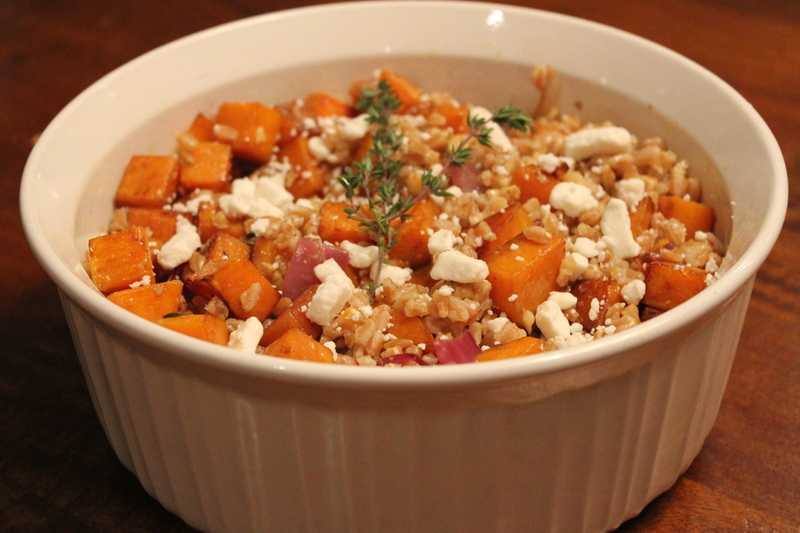 I thought this recipe was great for fall/winter. Yum! Preheat oven to 375 degrees. After rinsing the farro, combine with salt and water or stock in a large saucepan over medium heat. Cover and simmer, stirring occasionally until the farro is tender 15-20 minutes. Remove from heat, drain any water and set aside. While the farro is cooking toss the squash, onion and thyme with the olive oil. balsamic vinegar and couple pinches of salt on a baking sheet. Arrange in a single layer and place in the oven for 20 minutes. Turn the squash and onions about every 5-7 minutes to brown on all sides. Remove from oven and let cool a few minutes and then minced 1/2 of the red onions. In a large bowl toss everything (except cheese) with the oil. Taste and season as necessary. Garnish with goat cheese. I love the new foods fall brings. Squash, pumpkins, cranberries, grapes, and pomegranates. Yum. This only means new recipes! I bought 2 organic pumpkins when they first came out at the stores and cooked them up and froze them. I’ve had several batches of breads and this is the one we all voted the best recipe low sugar/fat and it is vegan too since I try to keep the eggs out of recipes since my daughter seems to be sensitive to them. Unfortunately no pictures since our camera is dead but Dan is getting one for his birthday in a few week so yippee! Whisk together oil, applesauce, maple syrup, pumpkin, molasses, milk, flax, and vanilla in a bowl. In another bowl, sift together flours, baking powder, baking soda, cinnamon, nutmeg and salt. 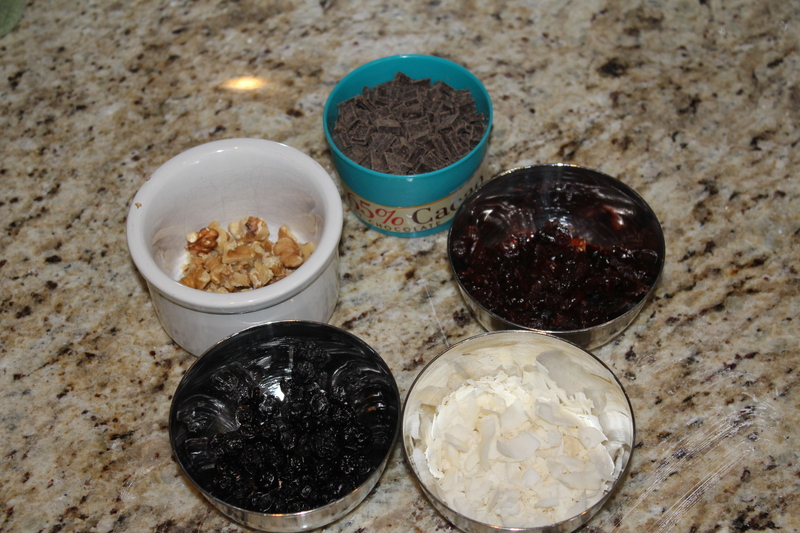 Add wet ingredients to the dry, mix gently until just combined then fold in the walnuts and chocolate. Pour into a lightly oiled loaf pan or 3 mini loaf pans and bake at 350° for 25-30 (for mini) 60-70 minutes (for large), or until a knife inserted into the center comes out clean. 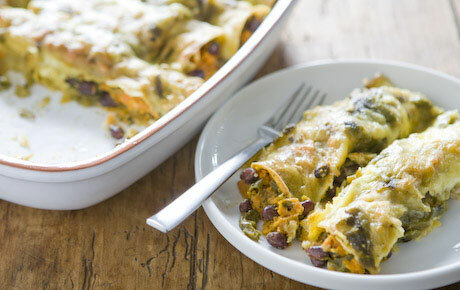 Otherwise known as Black Bean & Sweet Potato Enchiladas. These are black and orange so perfect for the Halloween week. This delicious meal is high in protein, vitamin A, and iron. *Note: If you use corn tortillas may want to use some oil or vegetable or chicken broth to soften the tortillas. Preheat oven to 375ºF. Heat oil in large skillet. Add onion and sauté 5 to 10 minutes or until soft. Add sweet potatoes. Cover and cook about 10 minutes or until tender. Stir in beans and greens. Cover and heat about 5 minutes until greens are wilted. Add a little water if necessary to prevent scorching. Season with sea salt and pepper to taste. in a shallow pan heat oil or vegetable broth in dip one tortilla in for 2 seconds on each side). Scoop a line of filling across the width of tortilla about 2 inches from the bottom. Spoon sour cream across filling. Roll enchilada up and place in pan, seam side down. Repeat until all filling has been used. Cover enchiladas with remaining sauce. Cover pan with foil and bake 20 minutes. Serve with sliced avocados and cilantro. So, I got some new cookbooks for my birthday and I finally got the chance to try a recipe out and it was easy and delicious so just had to share. The book was VeganYumYum (btw I had to use their fantastic picture since my did not come out). I only changed a few things… It called for Vegan Worcestershire Sauce which I did not have all the ingredients for and so I added some extra Tamari sauce and some garlic. Start the rice with two cups of cold water, or whatever ratio you of water:rice works best for the type of rice you are using. When the rice is almost complete, heat some vegetable oil in a large skillet. If using onion, add it and cook until golden brown and then add garlic and brown. Add spice mix and saute until spices begin to bubble up a little bit, being careful not to burn. Add beans, tamari and simmer on low, covered, until rice is done. Add peas, carrots, and corn and for a few moments until defrosted. 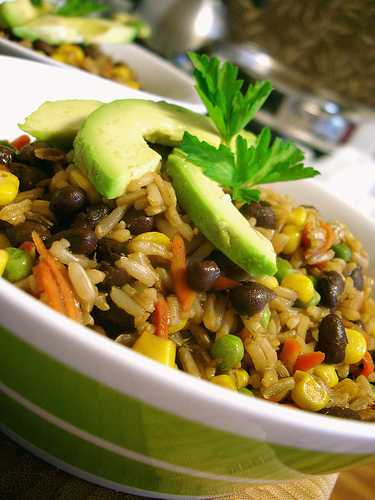 Add rice to pan, stirring well to mix in beans and veggies and coat with sauce. If you want to make it “richer”, stir in a knob of vegan butter at the end. Garnish with avocado and cilantro, serve immediately. I think it is so colorful and delicious, who doesn’t want to eat a rainbow? Happy Birthday to me! I got a new BlendTec blender. Those of you that do not know it is THE Rolls Royce of all blenders! They are used in restaurants, coffee shops, smoothie shops and more. 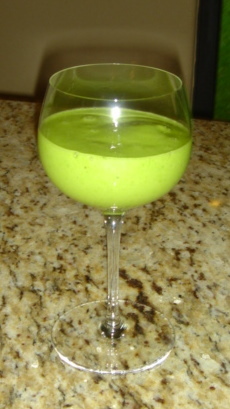 I first was interested in blenders about 1 ½ or so ago when I started making green smoothies. I had been making my green smoothies in the Magic Bullet or whatever blender I had around and they were fine but I had only dreamed of how smooth and creamy the ones were made in the BlendTec or Vitamix (the closest competition). My dream finally came true – yeah! A week or two before my birthday Whole Foods was demonstrating the VitaMix and CostCo was demonstrating the BlendTec. Was that I sign to be my birthday gift or what? I have had it about a week and have used it 30 times – how do I know? Because it keeps track of it! I’ve made my daily green smoothies, hummus, pesto and banana ice cream. I have not done any juices, soups, nut butters or ground any grains yet. I’m still trying to figure out the settings although they have 6 presets sometimes I like to play around with it and you kind of have to figure out how much water or liquid to add but so far I’m thrilled. Funny thing is everytime I run the blender Daniel runs out and says did what did you make mom? Is it a smoothie? He loves his smoothies and Sadie does most of the time and the great thing is you start the day off with your greens and you feel great. Try it and call it ‘Shrek Juice’ for the kids. P.S. 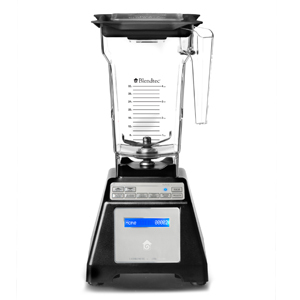 http://www.greensmoothiegirl.com uses BlendTec too! P.P.S. Sorry it has been awhile.. I’ve been volunteering, working with Dan, being a soccer mom, dealing with allergy kids and dog, visiting families with new babies and trying to stay sane with a little exercise through in there!